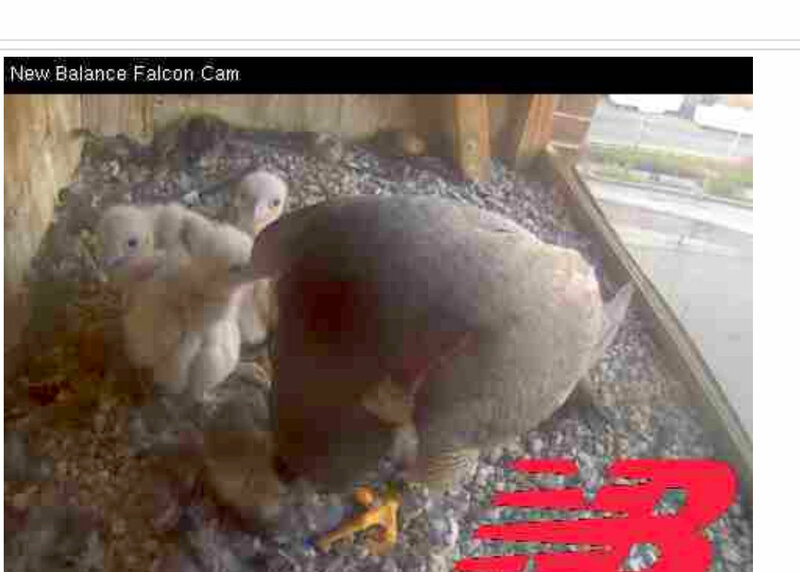 Peregrine chicks: 3 weeks old and growing! One of those wonderful moments to be able to observe as all 3 chicks are being fed with both female and male in the nest box! 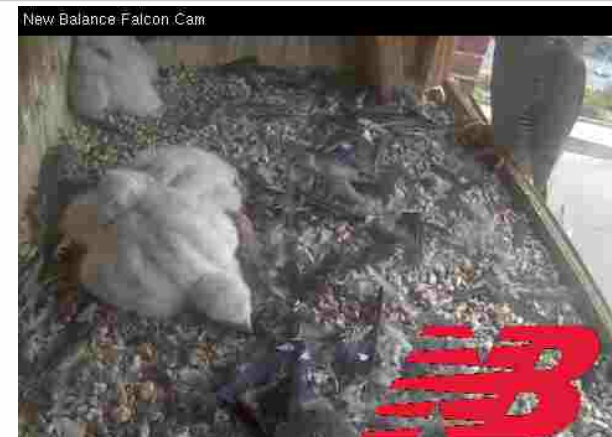 The chicks have been feasting and they require rest in between meals…sometimes they just flop down and snooze! Chicks waiting to be fed! Early morning and the chicks are hungry after a long night. Mother has left the nest and they patiently await her return with a tasty Bluejay for breakfast. It is fascinating to watch how the mother returns with avian prey and quickly removes all feathers to get at the good stuff! Almost like she is unwrapping a candy bar! Chicks feed and grow: getting stronger! 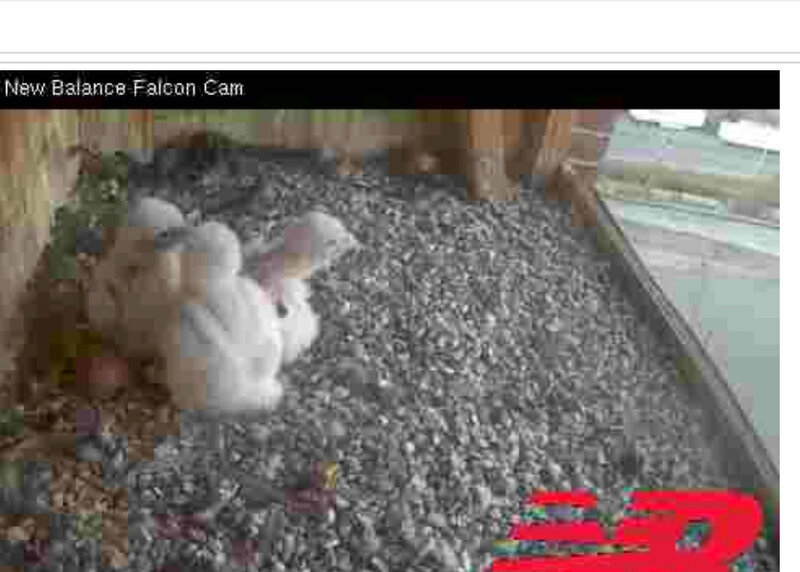 The 3 chicks continue to grow and gain strength! 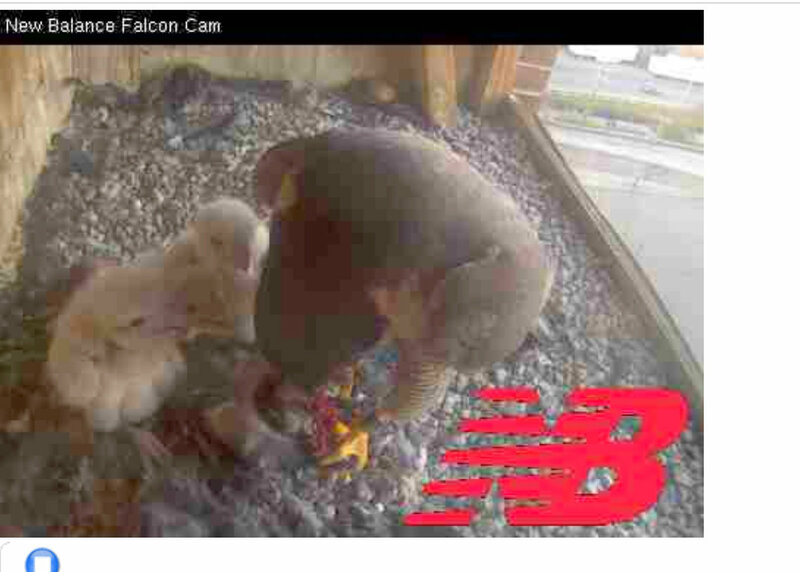 The peregrine chicks continue to be well fed and get larger. The mother has been most active in feeding the chicks and they all seem to be close to the same size. The mother is spending longer periods out of the nest allowing the chicks to take the first steps of being on their own! 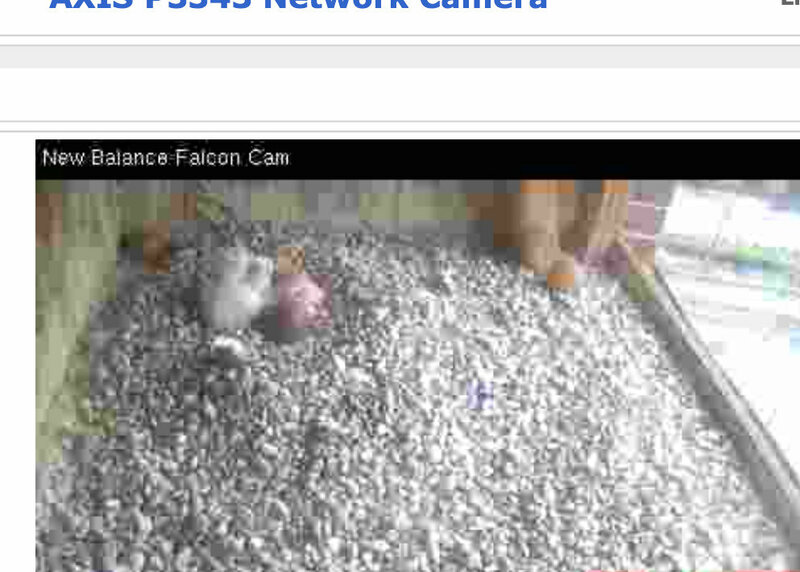 Three chicks have hatched; 4th not likely! 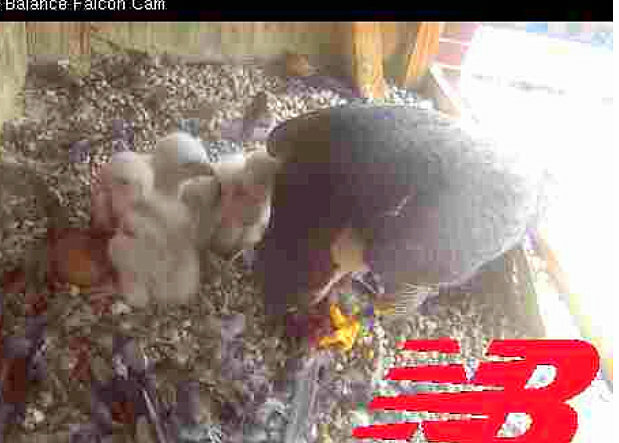 Three chicks have hatched in the Peregrine falcon nest high atop the Ayer Mill Clock Tower in downtown Lawrence; the fourth egg is not expected to hatch. The three chicks had emerged by May 2; the parents will eventually roll the fourth egg out of the “scrape” area and off to the side of the nest box. 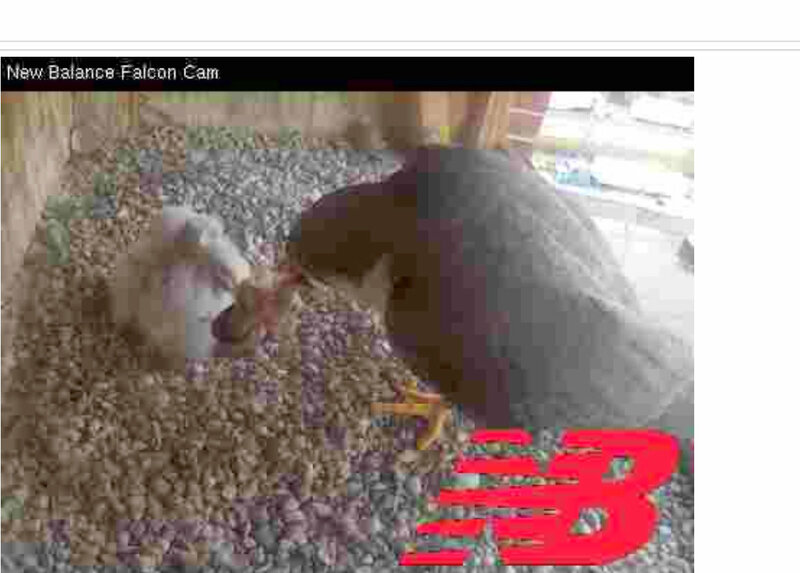 Viewers on the “New Balance Falconcam” now can see the adults brooding and feeding the nestlings, which need their parents to keep them warm for about 10 days until they can regulate their own body temperatures. The yolk inside the egg, which nourished the embryos during incubation, was absorbed into the body cavity of the chicks immediately prior to hatching. Although the yolk keeps the chicks well-nourished for a few days, their begging instinct kicks in right away. The adults feed the chicks bits of food by tearing off small chunks of meat and delicately placing them in the chicks’ beaks. 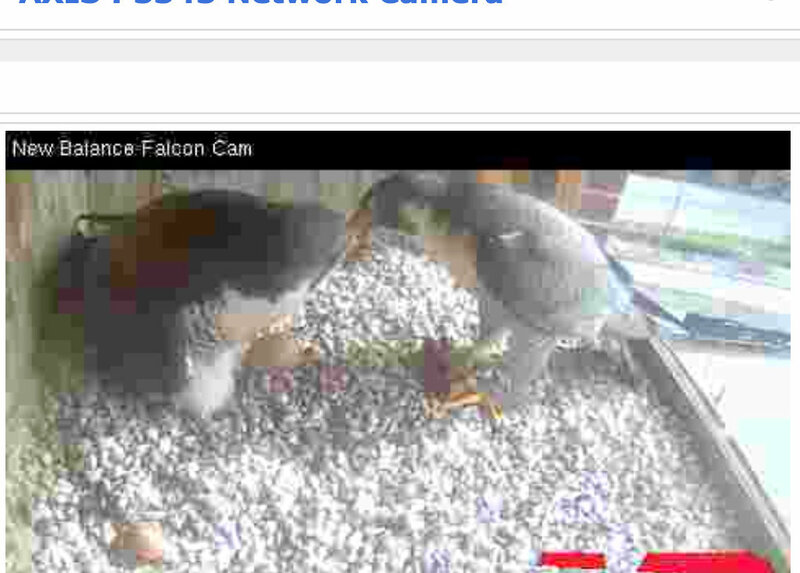 Access to the falcon cam from the home page of the Lawrence Peregrines blog! The feeding activity continues each day and the chicks devour all items brought to nest box….many Blue Jays on the menu! 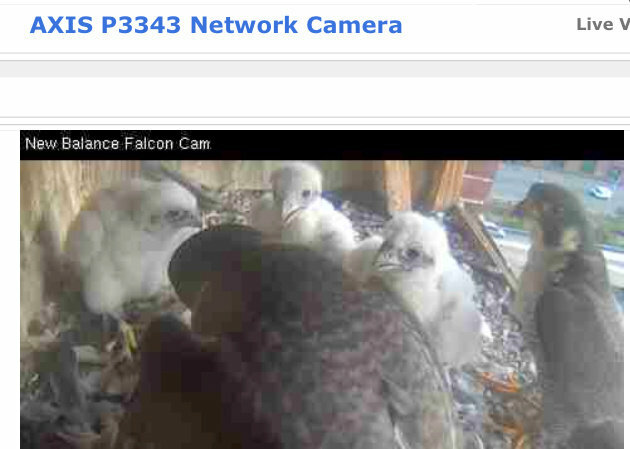 Peregrine chicks continue to feed and grow! The chicks continue to grow and are are able to have a few moments where female is in nest and nearby but not brooding all the time! 4th egg remains unhatched. Parents involved in food exchange! 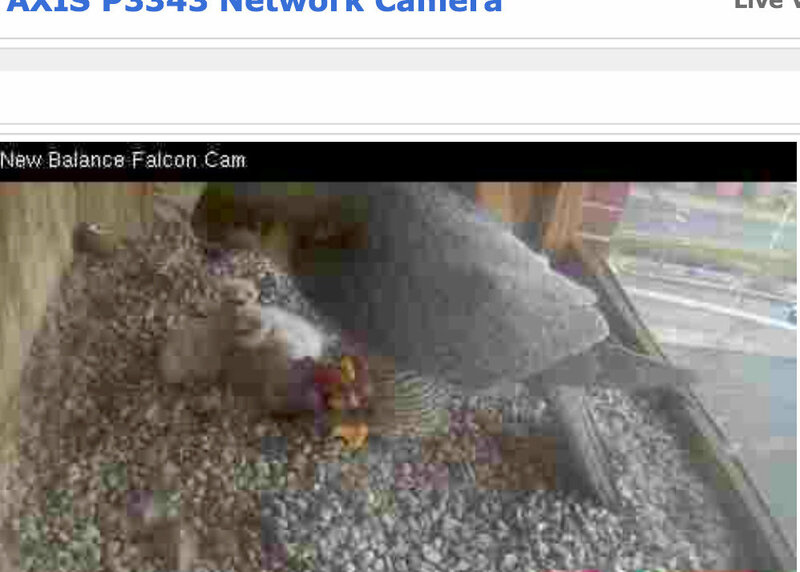 Peregrine chicks: now there are 3! Newly hatched chic ks weigh about 1.5 ounces and are virtually blind. Covered with only a light coat of fluffy white down, newborn chicks require constant brooding by the female in order to stay warm. 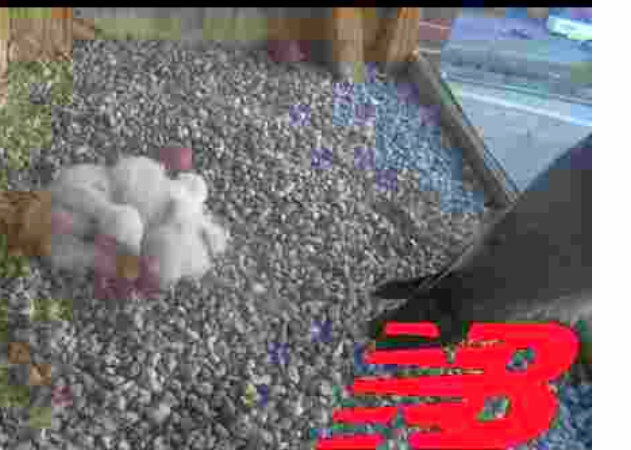 Feeding usually commences on day two when the small chick bobs its head looking for food. The female provides small pieces of food for the chicks! 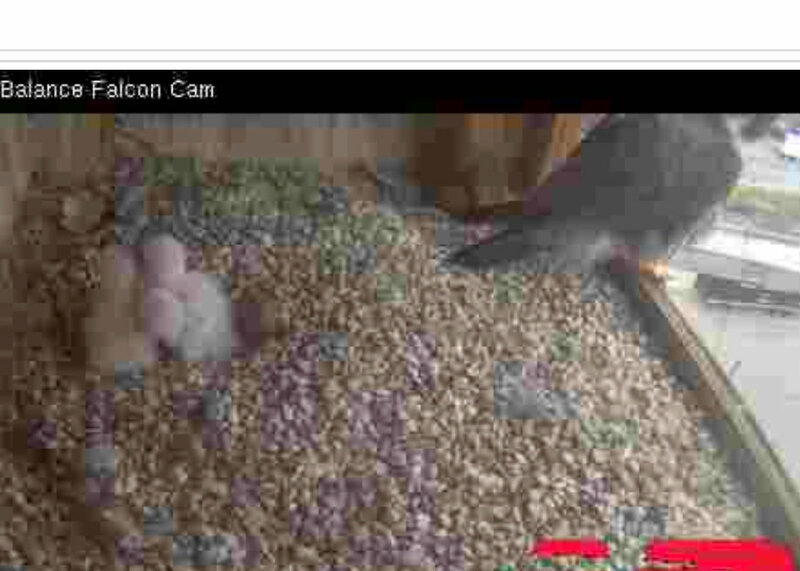 Peregrines hatch: first 2 eggs! Hatching begins after 30+ days when the chicks hammer a hole in the egg with a special “egg tooth” on the end of its beak. The chick makes a neat cut all the way around the egg, essentially cutting off the large end of the egg. This process may take up to 48 hours and requires a great deal of energy!